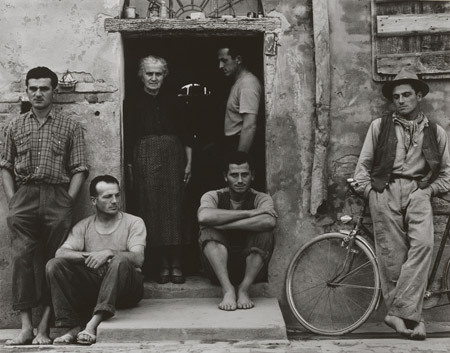 Paul Strand was, personally, an aloof man. In a new retrospective, we see how this detachment helped him shape modern photography. One lure of taking photographs is that you get to hide behind a machine and safely observe the world. You get to look, without being seen. This was especially true in the early days of photography when photographic equipment was bulky and when exposing the film or plate required a dark area at the back of the camera. The dark area was created with a black hood. The experience of taking a picture meant getting under that black hood and entering another world from which you could watch the real world outside. The pleasure of it must have been like being in a pillow fort as a child. You are in a safe and hidden space, but you get to peer out through the cracks between the pillows in order to see what all the adults are doing. “Paul Strand: Master of Modern Photography.” Through January 4, 2015 at the Philadelphia Museum of Art. But even Winogrand’s aggressiveness was, I think, a luxury of hiding behind the camera. The camera was his weapon and his defense. He didn’t have to encounter anyone in the street face-to-face when he was out there taking pictures. He was never fully naked. He was never fully exposed. Everything he experienced could be filtered through the reality of the lens and the viewfinder. Winogrand once said, “I have a burning desire to see what things look like photographed by me.” There is incredible egotism in this statement. There is also the tacit admission of vulnerability. Winogrand badly wanted to look at the world, but only when the world had been safely captured in his image. The first truly great master of photography-as-the-art-of-detached observation was Paul Strand. Strand was born in 1890 and lived all the way until 1976. The story of Strand’s life is, in many ways, the story of how photography became a modern art form. There’s a retrospective of the Paul Strand story currently on exhibit at the Philadelphia Museum of Art (Paul Strand: Master of Modern Photography). The Philadelphia Museum, with its recent acquisitions, currently owns the world’s largest collection of Strand’s work. 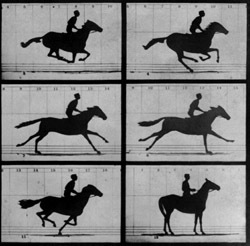 You can see, in the exhibit, Strand’s first photographic pictures from the very beginning of the 20th century. Strand was, at the time, heavily influenced by a movement called Pictorialism. Pictorialists wanted to take the rough edges out of photographs. They wanted photography to be more like painting. They used soft focus techniques. They sometimes added color, brushstrokes, and other effects to their prints to enhance the sense that these photographs could be paintings. They made pictures that were moody and diffuse. Strand showed some of his Pictorialist photographs to the influential and older photographer Alfred Stieglitz. Stieglitz told Strand to ditch the Pictorialism. He advised Strand, in so many words, to let photographs be photographs. That’s a central tenant of Modernism. Don’t be afraid of the medium. Embrace it. If photographs produce harsh, extremely detailed images, so be it. The harshness, the detail, the inherent realism — these can all be strengths. With Stieglitz and Strand, photography stopped trying to be like painting and started truly to become its own art form. 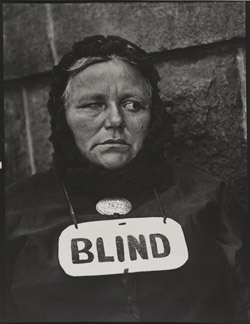 One of Paul Strand’s most famous early pictures is a portrait of a blind woman (Blind, 1916). The woman is standing on a street corner in New York City. Her right eye is heavily damaged. Her left eye looks sharply off to her left. Around her neck is a hand-painted sign that reads, “BLIND.” Above the sign hangs a small medallion with a number on it. It is her vendor’s license. Blind couldn’t be further away from Pictorialism. It is a rough and confrontational image. It is a gritty picture of social reality in 1916 urban America. Paul Strand was highly sensitive to social injustice, to the plight of the poor and downtrodden. He wanted to take pictures of real people: workers, peasants, the socially marginalized. This desire eventually led Strand from photography into film. He travelled to Mexico in the 1930s and made a film called Redes (1936) about a fishing village along the Gulf Coast of Mexico. 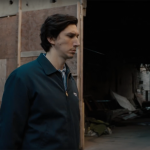 The film is a tale of social justice — or the lack thereof — and class politics. It is a heavy-handed narrative, to say the least. Strand made another film about the working class struggle in the US, Native Land (1942). But the film was released a few days after the attack on Pearl Harbor. Union organizing ceased — with the declaration of war against Japan — to be a national priority. Strand had missed his political moment. So, he went back to snapping photographs. Strand realized, in retrospect, that he’d always preferred the solitary and otherwise lonely work of the photographer to the inherently collaborative work of the filmmaker. The decision to return to photography seems to have been born of an accurate self-assessment. Strand wasn’t good at working with other people. He was most at home alone, behind the camera. Strand was personally aloof even when away from the camera. His close friends described him as difficult to know, guarded, unwilling to talk about feelings. In a 1989 documentary about Paul Strand (Strand, Under the Dark Cloth) his second wife, Virginia Stevens, describes Strand as being essentially unavailable to her. Strand took Stevens to the Gaspé in Quebec for their honeymoon mostly so that he could shoot pictures of the beautiful coastline. He showed Stevens how to look at slabs of stone and the wood on the sides of barns. Stevens says this was all a revelation to her. But the revelations were those of a life-teacher and mentor, not a husband. Strand’s photography had great passion in it, Stevens says, but as a person Strand “could not sit and touch you and caress you, he could not do that.” It has been said by more than one person who knew Strand that he was a lover of humanity in the abstract, but not necessarily of the individuals out of which that humanity is composed. During his marriage to Virginia Stevens, Strand started seeing a psychologist. When Stevens asked him what they talked about, Strand answered, “Photography.” Stevens came to the conclusion that people like Strand are not disposed toward self-analysis. It is dangerous to their art. Strand was obsessed with visual images, with what they reveal in the clarity of their surfaces. He wasn’t interested in the insides — his own or anyone else’s. Strand needed to strip all the other material of life away, Stevens said, “and be clean and clear and work.” Strand’s personality mirrored what might be the core dichotomy of the art of photography. 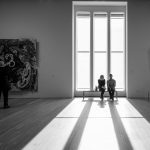 Photography draws us closer to human experience by creating images that distance us from that very experience. The photographer gets to look closely at people and things in the world by staring into a little box of reflections. Paul Strand the man was an especially good candidate for being a great photographer. He was fascinated by people and could barely stand to get near them. The more you look at a picture like Blind, the more you see those two tendencies written right there on the photograph. It is an honest and forthright picture of an individual woman. Strand really and truly looked at this woman, a woman who was mostly invisible (and who lived in a sightless world herself) to the people passing in the street. She can’t see and she doesn’t get seen. Strand wants to see her. At the same time, Strand is held at a distance from the woman by the very apparatus he is using to see her. Looking at her in the image on the other side of the camera, the blind woman has already become for Strand a visual specimen to be studied and analyzed. This feeling is enhanced by the medallion with the vendor’s number around the woman’s neck. She is being numbered and catalogued. Blind Woman, number 2622. You can see the same tension in the nature photographs Strand took about a decade later. 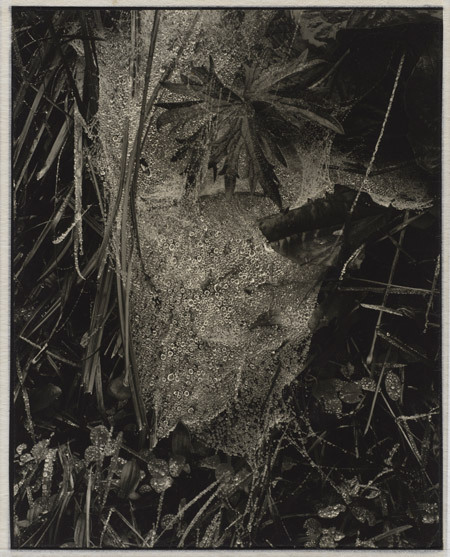 In 1927, Strand took a picture in Maine known as Cobweb in Rain. It shows thousands of individual raindrops captured in a web. Strand is looking very closely at nature here. You want to say he is looking lovingly, but it isn’t true. There is too much analysis for that. Leaves and grass and trees are fully alive in Strand’s shot, but the picture is a study in the formal properties of nature. Living things have become abstractions. Cobweb in Rain is a picture that is both “close-up” and completely detached. Strand moved to Europe at the very end of the 1940s and lived mostly in a small town in France for the rest of his life. In the towns and villages of Europe, Strand discovered subject matter that his art had always been seeking. Strand took pictures of dozens of people in Luzzara, Italy. He assembled the photos into a book. The book gradually reveals, page after page, the story of the town. Everyone is related in some way to everyone else. The reality of each individual life and the reality of the social life of the place are interwoven. Nothing is hidden. With the eye of the machine, Stieglitz … has shown that the portrait of an individual is really the sum of a hundred or more photographs. He has looked with three eyes and has been able to hold, by purely photographic means, space-filling, tonality and tactility, line and form, that moment when the forces at work in human beings become most intensely physical and objective. In thus revealing the spirit of the individual he has documented the world of that individual. The best illustration of these ideas is a photo generally known by the title The Family. It was taken by Strand in Luzzara in 1953. The Family shows a mother standing in a doorway surrounded by five of her adult sons. The photograph is highly posed. Strand told everyone where to stand and what direction to face. The result is a study of five different kinds of men and a mother, the totality of which make up the reality of this specific family. The son sitting on the ground looks straight at the camera, bemused. His brother to the right gazes to the side, taciturn. The son in the doorway stands directly across from his mother, watching her with a physical protectiveness.